Adopt a Path is a flagship volunteering initiative of the Outdoor Access Trust for Scotland being delivered as part of our project, The Mountains and The People. Adopt a Path allows those passionate about Scotland’s mountains to become custodians of some of our most iconic hill paths, conserving fragile upland landscapes by reporting on erosion damage, potential path issues and allowing maintenance tasks to be targeted to best effect. 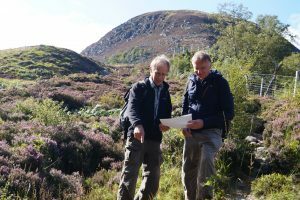 Adopt a Path volunteers receive training and support to be able to undertake their surveys in a safe manner which provides the information we require to ensure these mountain paths are maintained for generations to come. There are paths available for adoption in both of our National Parks, Cairngorms and Loch Lomond and Trossachs. Each path is unique, some long or remote, others short and more accessible. The paths included in the scheme can be found on the map below. For more information about how to get involved with the Adopt a Path scheme, please visit our About page.